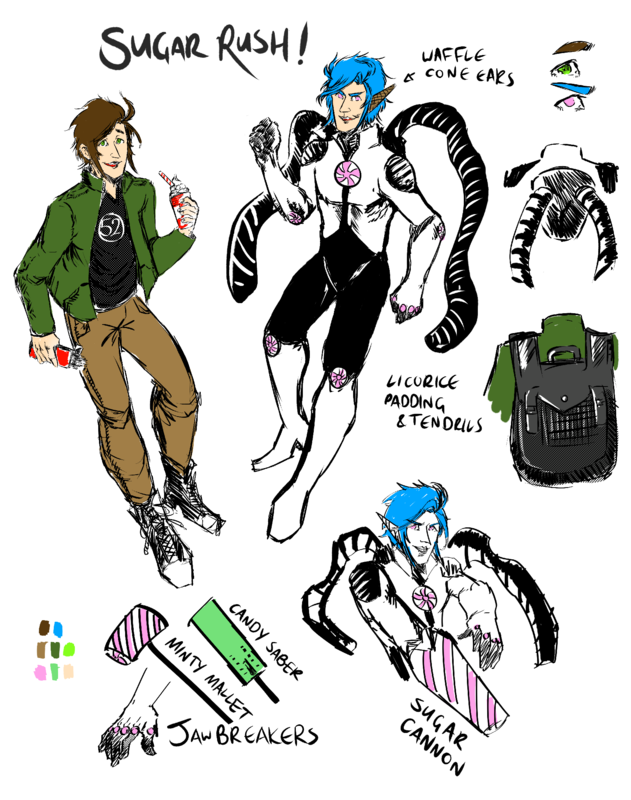 Spencer Ribose is a student at Void Uni with a grave sweettooth. Unfortunately, he's also diabetic, which means he doesn't get to indulge in many treats. One day while leaving the Uni he saw something crash in the nearby woods: a cosmic gumball who calls herself Melly. The symbiotic being proposed this: if Spencer becomes her host, he will be able to eat all the sugar he'd like. However, that's ALL he can consume-- oh, he's already chewing Melly. After blowing a huge bubble, it pops and encases him in a chrysalis, emerging as Sugar Rush! He now has the powers of manipulating all sugar and using it to regenerate/heal. If he gets burnt? it turns to caramel. Sugar Rush has the power of communicating with all gummy animals as well. His attire gets sugar-fied, so it can change if the artist changes what he's wearing prior to transforming. His weapons are anything you can imagine with candy, sugar, or sweets in general (his main ones being on the design sheet). His breath also changes according to how he's feeling. IE: minty if he's confident, strawberry if he's swooned, etc. Personality-wise, Spencer's a goof. Likely to be hosting a gummy-bear coliseum behind his books in the middle of class and eat his own resources in the middle of battle from time to time.